This TVC concept is made for raising awareness regarding special children/disabled persons/neglected persons of the society and asking the audience to give them respect, help them and teach them to care such special people in life. This TVC concept is also asking for cash donations and can be used on social media, websites and all other digital platforms. You can also search fundraising proposal here. They are playing in playground and all of a sudden they see special kids and without knowing them, start bashing them like go away from here. Parents of normal kids come forward and ask them to apologize and shake hands with special kids while giving information about “special kids” to their children. Now to develop sense of empathy and love towards “special kids” Parents bring their children with them to Rising Sun Institute. Kids are playing with special kids and giving them gifts in the end. Here you will learn from my 10 years of experience exclusively in fundraising for NGO and Schools. I will try to provide you a list with details of all the methods we used for fundraising. As introduction I want to tell that i was very successful to raise funds for my ngo. When I joined this ngo its annual operational expenses were 10 million a year and now the annual expenses are more than 120 million a year. I am fulfilling all the requirements of my ngo with just a team of 4 members. You can find our annual plan for fundraising, requirements of budget, yearly activities for fundraising. Keep in mind my ngo work at one city only and our donor network is also limited. We are not like bigger ngos who raise funds at national level. So starting with our main tools for fundraising. I will list down all the methods with priorities we are using. Direct donation request letters for individuals and companies with brochure is very useful and most responsive fundraising method for every NGO, Business or a charity organization. You shall collect data and start sending letters and later screen out the correct data vs incorrect data, responsive data vs non responsive. Keep in mind on your first letter response will be minimum so you may need to send at least three letters to get maximum response from any data. You must provide/write a genuine reason to raise funds and if you are write of old donors than you must start letter with thanking them for their previous contribution. Sending donation requests in sms is also becoming most responsive, quick and cost effective for fundraising. From SMS normally response comes in minutes and hours. You can have list of donor mobile numbers. You can have list of golden mobile numbers. You can have list of business mans mobile numbers. Some time sms becomes most irritating so please do not send repeated sms. SMS should be once in two weeks if necessary. not more than this at all. You will find this fascinating when calling to your old donors and reminding them for donations. Please remember to keep the call very short and limit to donation request with reason only. It is also easy and great method to raise funds from school. You have to get permission from the school administration for fundraising campaign and manage to reward the students with appreciation certificates for their participation. The amount depends on the school strength and financial background of the students. You can ask the students to sell tickets or simply give them envelopes with donation request to donate amount and tell them the reward for certain amounts. You will get very good response. You can place donation boxes in malls, pharmacies and various other types of shops in your area. But as per my experience donation boxes in pharmacies give maximum outcome. This method also need some struggle like various visits to get permission and place the box, late collecting amount from the boxes regularly. You can use the crowdfunding platforms for fundraising as part of your campaign. We also used some platforms and successfully raised funds for some of our projects. But to use these platforms you need design attractive campaign and later you have to promote it within your circle for fundraising. We were using Gofundme and globalgiving for our fundraising campaigns. How and Where We Collect Data of Donors? We purchase business directories, booklets, phone directories, business unions like chamber of commerce, textile, sugar, steel, software houses, society residents, society members and every source where we can find names, addresses, phones, etc related to individuals and businesses. Even we are also used to note resident names from the gates of good/worthy houses. 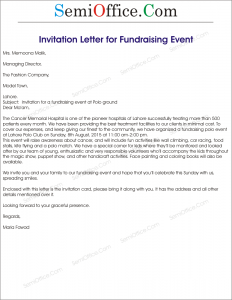 Sample invitation letter to invite guests and donors in a fundraising event for welfare society, welfare organization, school, dispensary and hospital etc etc. The Cancer Memorial Hospital is one of the pioneer hospitals of Lahore successfully treating more than 500 patients every month. We have been providing the best treatment facilities to our clients in minimal cost. 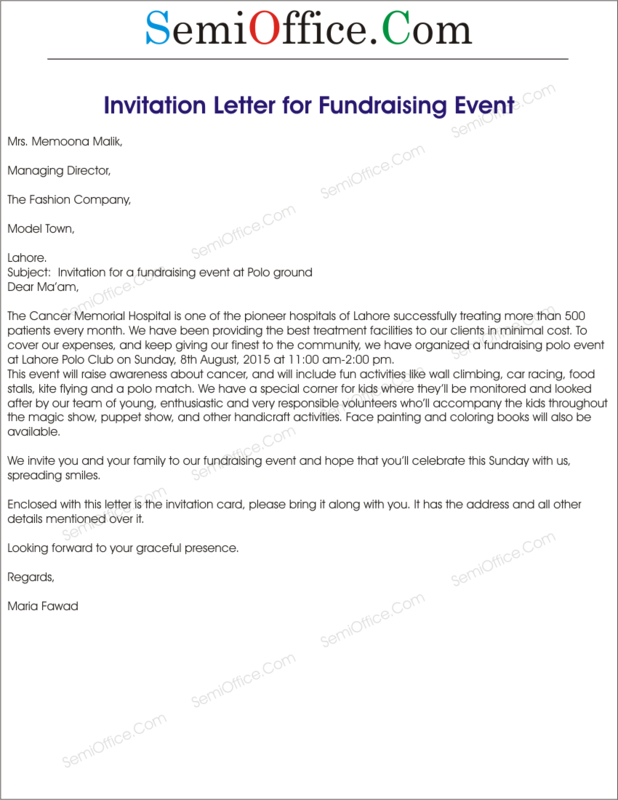 To cover our expenses, and keep giving our finest to the community, we have organized a fundraising polo event at Lahore Polo Club on Sunday, 8th August, 2015 at 11:00 am-2:00 pm. This event will raise awareness about cancer, and will include fun activities like wall climbing, car racing, food stalls, kite flying and a polo match. We have a special corner for kids where they’ll be monitored and looked after by our team of young, enthusiastic and very responsible volunteers who’ll accompany the kids throughout the magic show, puppet show, and other handicraft activities. Face painting and coloring books will also be available. We invite you and your family to our fundraising event and hope that you’ll celebrate this Sunday with us, spreading smiles. I hope you all find this letter in good health. On 23 May 20XX Monday we are arranging a fundraising event for clean food and water for poor children of Africa. We all have been blessed greatly by the Almighty and its time we spread this light to those who are less fortunate than us. We live a life everyday that is just so simple comparing to them we always wait for the unveiling of newest gadgets whereas they are desperate to fulfill their basic needs. I hope you all will join us with every ounce of compassion you have for the humanity and together we will be able to make a difference in someone’s life.